Repeat that for all six petals. Pull it tight. Stitch back through the first petal to secure; knot and trim the thread. Now attach the center. I used an oversized yellow brad, but a button or a fabric covered button would look adorable too. I secured it with fabric glue. I would stitch the button to the backside. Cut a small circle of felt and glue to secure the back of the daisy. I made sure to get the glue in between the petals and on as much contact surface as possible. I covered a hair clip with light green ribbon (I used hot glue, and just wrapped the ribbon on all sides of the clip). Use fabric glue to adhere the flower to the hair clip. Thanks so much for sharing, Melynie! OMG so CUTE! Thanx for the tutorial, I love hair clips and I've got a little niece that would just love that. Thank you for the great tutorial, I've been wanting to make more fabric flowers! I will try! Thanks for your tutorial and, of course, your lovely blog full of inspirations! Very pretty and so simple!! Thanks for sharing!! Great idea, I love the fabric flowers.Generally this site is amazing.Greetings from Iva and green hills of the Czech Republic. Thank you so much for this! I used it for a curtain in my kitchen. I linked back to you! 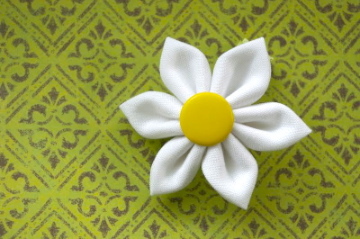 I want to thank you so much, I've been searching for a small sweet fabric flower - I was bored with the Yo Yo flowers, and this sweet daisy is a perfect for an apron emblishment! Fabulous tutorial, easy to follow!!! !